so i ran the beloved chair gun program and it said i should hold over one mil dot at 20 yards, but it turned out to be three!!! so i figured i didn't have the generic mil dot calibration right. i know the scope has 1/4 moa that's about it. thanks for your help. i really want to get this dallied in. Sorry, I don't understand your "fill in the blank" questions? If calibrating your scope, you can use any magnification you want, preferably the magnifications you shoot at most (e.g 5x and 10x). Try watching these two videos, part 1 and 2. The chairgun used in the video is obviously outdated but it still gives you the general idea. I've done it this way and now can make shots out to 95 yards with my trusty 'scope cap cheat sheet' and rangefinder. Your problem may have been due to not entering the correct/full information such as pellet b.c, scope height, velocity etc. Ths vdeo may help you as it did me when calibrating my scope and air rifle. 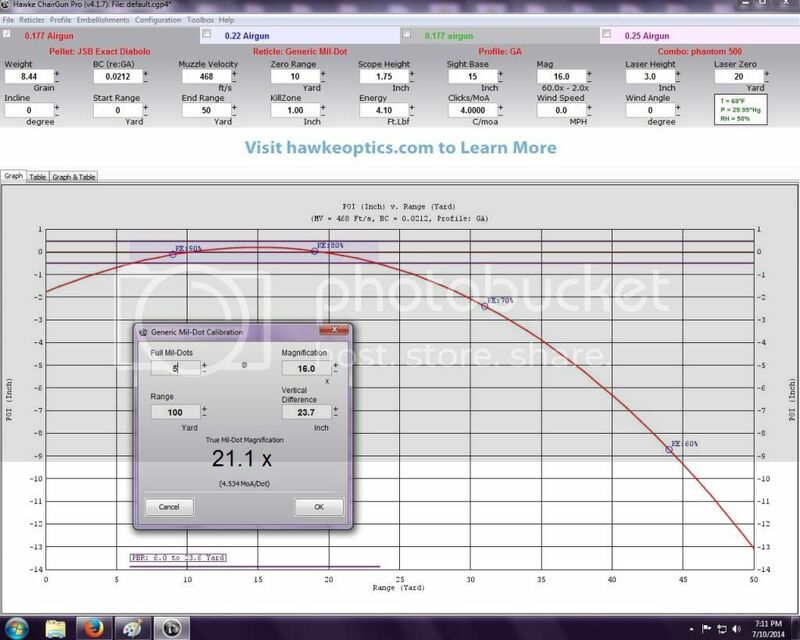 Only differences I did was make a bit more accurate measure of center of scope to center of barrel..
i'll watch the videos again. i just can't it to line up to where it should be. the POI and hold over/ under in MIL_DOTS. the value of poi makes sense, but the mil dots are completely wrong. l love this program and would love to have it working to it's fullest. according to chair gun i should bee in the kill zone. if you need more info or pic just ask. i have to get this figured out. side note: i can change the values in the mil-dot calibration but they won't stick. I suspect the first POI is off. Try setting the scope at 10 power, zero at 20 yards and check the POI at 10 yards. If your speed is 468 fps you should have a first POI at 10 yards and a second POI at about 20 yards. Don't worry about mil dots until the rifle shoots near the 10 and 20 yard zeros. I suspect your rifle suffers from barrel "Droop"
ok i will set my poi for 20 yards and see where that gets me. thanks for your help guys. i have to get this working. i really appreciate it guys, you have now idea how much!!!! so i set the zero to 20 yards (measured) and the poi at 10 yards (measured) is now 1" high !??! chair gun says it should be basically zero. i did set the scope height too. thanks for your continued help with this one. how can i be a sniper when i can't this working??? do you think i can get the sub 500 mod 33 reach out to a thousand yards, any time soon?? I've read somewhere (sorry, can't recall where) that the ballistic coefficient of a pellet is an approximation that can vary +/- 15%. Perhaps adjust the BC +/- 15% and see how the new values concur with the old. Than I guess we will have to disagree. I realize the barrel and sight line must intersect at some point in order for a scoped rifle to work. The problem arises when the barrel and sight are pointing in different directions to start with. How are chairguns calculations for drop supposed to work if the barrel droop is causing the pellet to drop more than velocity decrease and friction are predicted to cause? If you shoot a pellet through a gun sighted in at 10yds and the drop over 20yds is predicted to be -1" and -4" at 40yds(just approximate numbers) chairguns predictions will be correct in a gun with parallel bore and sight. If you shoot the pellet through a drooped barrel that causes 6" of drop at 10yds (an extreme example) and it is sighted in for 10yds,, it will have-12" + the actual 1"(13") drop at 20yds and -24"+ -4"(28") at 40. There is no way chairgun can take "droop" into account as every gun that has droop has different"droop"
Bore and scope must be close to parallel for the calculations to work. In a gun with no droop, where the boreline and the scope centerline are parallel, and the scope is 1" above the barrel, a line through the scope will be pointing down 1" at 10 yards (to sight in the gun), 2" at 20 yards, and 4" at 40 yards, relative to the boreline.... Add the "drop" of 1" at 20 yards and 4" at 40 yards (relative to the boreline), and you have the pellet hitting 1" high at 20 yards, relative to the POA, and dead on at 40 yards.... Looks the same to me !! !